Chromosome 14 syndromes are rare genetic disorders. In some cases, one of the two chromosomes assumes the form of a ring resulting in “Ring14 syndrome,” characterized by early onset refractory epilepsy, motor and mental retardation, and a multitude of other physical challenges. In other chromosomal syndromes, the 14th pair loses or transfers genetic material (deletions or duplications) but often share a similar clinical picture. 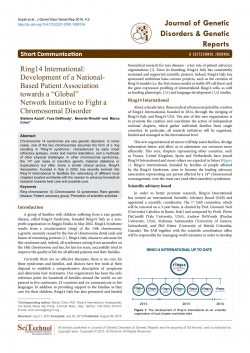 Ring14 Association, founded in Italy in 2002, has recently evolved into Ring14 International to facilitate the networking of different local chapters located worldwide with the mission to advance biomedical research towards best care and possible cure.